thrv is the first and only Jobs-to-be-Done software that aligns your product, marketing, and sales teams with your customers. 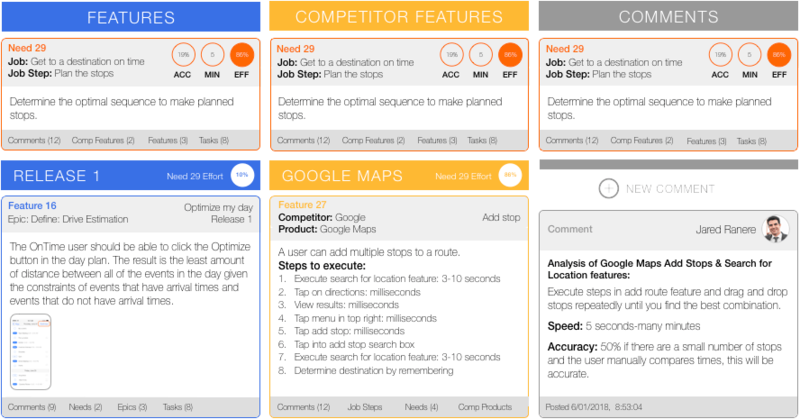 thrv makes JTBD faster and easier for your team to execute. The thrv software puts your customer research in one place and aligns it with your roadmap. 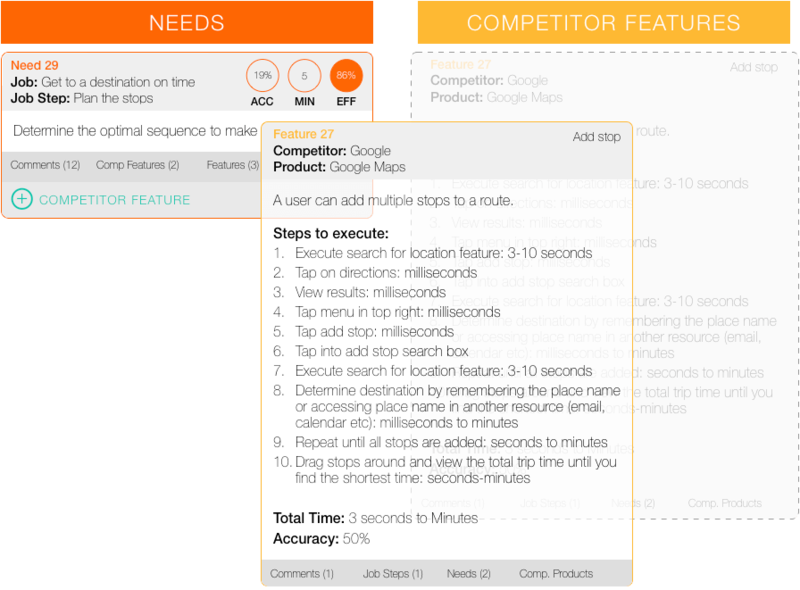 Give your team common criteria for determining which feature ideas are worth building. Calculate the customer value each release will deliver and make the right decisions to build high-growth products. Unlike other product management methods, thrv is built with an obsessive customer focus. Our software allows you to do more with your research investment rather than letting it get lost in an old file folder. thrv enables you to quantify customer needs so that you know what to tackle first. The thrv needs list shows you the user journey, and the quantitative metrics so you can prioritize. Easily identify each need and explain your customer's struggle to get the job done with your competitor's products. Don't build the same thing as your competitors - be confident that you are building more value. thrv shows your competitive analysis of the existing solutions so that the benchmark is visible to your entire team. All needs in thrv can be associated with competitive features to quickly reveal your competitor's weaknesses. The data in thrv is the springboard to generating successful ideas. Your team can see all the criteria for high-growth features in one place - the customer need, how the existing solutions satisfy the need, and any thoughts from your team. Organize your features to plan how you will deliver customer value over time. 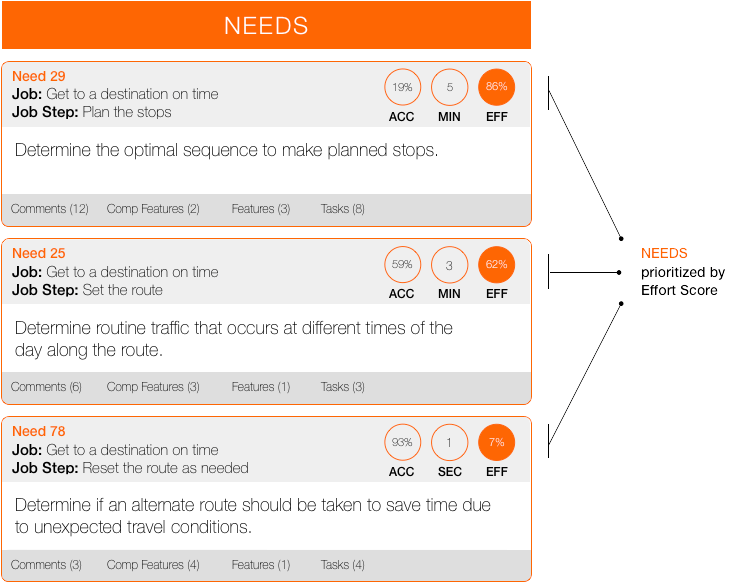 thrv enables your team to prioritize features based on which unmet needs will be satisfied. Your team can compare how well your new feature will satisfy the need to how well the need is satified in the market. This is the best way to de-risk your product roadmap investment. Each feature in a release has tasks that are required to build the feature. Each task can be estimated (in story points or hours) to quickly give your team an assessment of the cost and effort to add customer value by getting the job done better. Keep your team in agreement on which feature ideas should be built next. Your team can comment on every object in thrv, buliding on each other's ideas, settling debates, and keeping a record of how decisions were made. thrv helps ensure that when your team is executing, they understand not just what they are building but why they are building it. Every task in thrv is associated with features and customer needs to help your team maintain obsessive customer focus. Plan multiple versions of releases in thrv and quickly determine if a release will deliver more value to your customers than your competitors. This mitigates the risk that you build and launch a release that does not add customer value. thrv helps ensure that your team succeeds at the one thing that matters to your company: creating equity value with less risk. You can feel confident that you're doing the best work of your career.